Update: Arkham Horror: The Card Game has been released and you can read our review here. Original Article: So it looks like our prediction and the leaked images where right – not only are Fantasy Flight Games releasing another Living Card Game (LCG) this year, it’s going to be Arkham Horror. You may remember towards the end of May we posted a leaked image on the internet that suggested that Fantasy Flight Games were developing a new LCG based on their Arkham Horror and Cthulhu Mythos world. The leak seemed to fit our own prediction that Fantasy Flight would release a new LCG at Gen Con, as they have released a new game in their LCG range almost every year. It also agreed with our thoughts that since the end of the Call of Cthulhu LCG, a new game in the Cthulhu Mythos would fit. Well Arkham Horror the Card Game was announced at Gen Con this last weekend. Fantasy Flight Games have released a lot more information about the new Arkham LCG and much of it fits our speculation. It is going to be a cooperative game, in a similar vein to the Lord of the Rings LCG. It’s also going to be a solo or two player game out of the box, but can be expanded to four players if you purchase two core sets. This again sounds very similar to the Lord of the Rings LCG, but you could get round the two set requirement if you were happy to substitute a few counters and tokens. Where the Arkham Horror The Card Game looks different, is a new campaign aspect. The game can still be played standalone, but there is a definite emphasis on an ongoing campaign where your character progresses and evolves. This is most evident where the purchase of certain cards for you deck rely on your character being a high enough level. What I am excited about is that this also gives the opportunity for player’s character to develop various insanities. 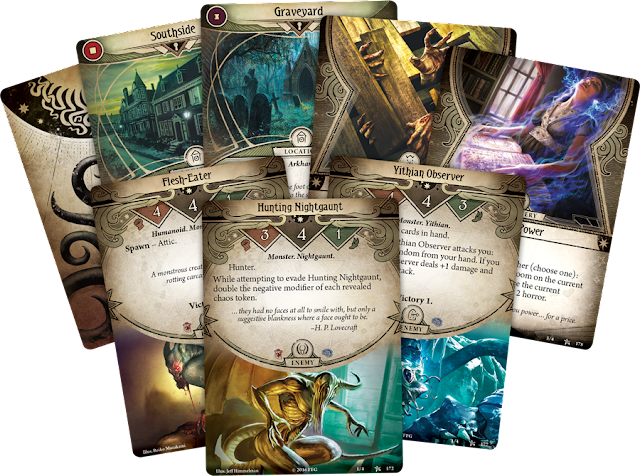 Fantasy Flight Games are promising that there will be plenty of strategic play in Arkham Horror the Card Game, with plenty of options available in how you handle the campaign and in how you will customise your deck.